Elder Nelson repeated the phrase that is the title of his talk so many times that all of my children started paying attention. 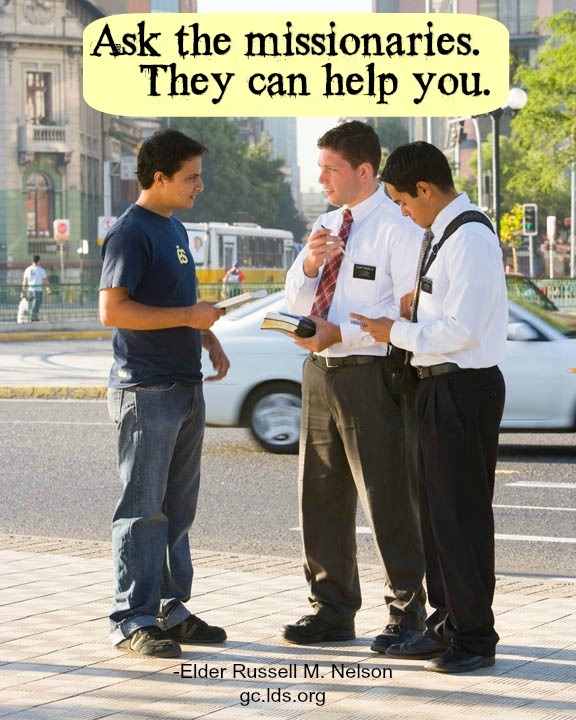 Every time he started building up to it, my son Clark would say, “Oh no, not again!,” and then Elder Nelson would say again: “Ask the missionaries. They can help you.” Even now, they remember that specific phrase from conference, so it was definitely memorable. I thought this was a fun talk in context of the big announcement about the new age requirements for missionary service. We were all already missionary-minded, knowing that we have to get to work to get our children prepared sooner for missionary service, and then Elder Nelson’s talk reinforced why that is so important. Also, I know this wasn’t the point of his talk, but I really love the Preach My Gospel manual that missionaries study and teach. I think if we use that as the curriculum to prepare our own children for future missionary service, they will be remarkably up for the task. I love missionaries and missionary work. I cannot think of my own time as a missionary without being filled with gratitude for all I learned and felt as the Lord let me serve. I’m so excited for this rising generation and the opportunity they will have to join a royal army and go forth and do amazing things as the Lord is hastening His work. You may have noticed completely different things as you studied this talk. Please share in the comments below some of the things you learned and felt. « In which I become a cat lady and say controversial things. I love the weekly reminders I receive from GCBC to read a talk. It should be easy enough to remember on my own, but I guess I get easily distracted. While reading over Elder Nelson’s talk today, I thought of a friend who is less-active (ok, completely inactive). I just sent her the link to watch it. And then I thought about how easy it is to share these talks, and it made me want to do it more often. I’m grateful for those promptings. This talk make me think about how we are all member missionaries and how we can always be striving to find people who we can help/being willing to help those around us. It also make me think about all of the thing that I could learn more about so that if I am ever asked I will be more prepared to answer and help those around me. The last thing, along those same lines, was that my children will hopefully one day serve full time missions. If I want them to know these thing and be able to teach others about them, then I need to be able to teach my children about them first. I love Preach My Gospel. I have been feeling like after we are done with “For the strength of the youth” we need to start with Preach my Gospel. I was so happy to get my Nov Ensign in the mail this week. I love marking my copy and having all of the talks together. One of the things that stood out to me in this talk was his brief synopsis of the apostasy and the restoration of the church. Whenever I am reminded of this, it is such a testimony builder to me and it makes me so grateful to know about the gospel – and to want to share my knowledge with others. Yes, this was a memorable talk. In Primary they asked the children what talk they remembered from conference and my 4-year-old said, “about the boys on the bikes!” We hadn’t discussed the talk after conference, so she just remembered from watching. The story about stopping the boys on the bikes is so wonderful! I really liked this talk and a discussion of how the missionaries can help. When it was being given I was smiling thinking of missionaries watching it and their eyes getting wider picturing people asking them about all these things. In that way it can be thought of as a message of preparedness ideas for future and current missionaries.